Ocean acidification is an emerging global concern and is a risk to marine biodiversity, ecosystems and human society. This event will highlight initiatives to address the challenges associated with ocean acidification, including the need for greater international observation and coordination. 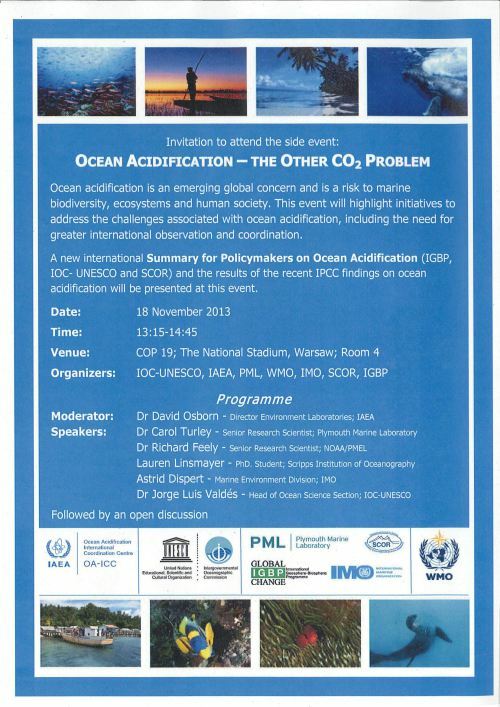 A new international Summary for Policymakers on Ocean Acidification (IGBP, IOC-UNESCO and SCOR) and the results of the recent IPCC findings on ocean acidification will be presented at this event. Please, find the link to the video presentation of the COP19 side event here. Additional information can also be found at the Ocean Scientist for Informed Policy website.